In 21%–68% of cases, the elbow joint is involved in rheumatoid arthritis (RA) [1–4]. Only in rare cases, i.e., 1.7%–3% [5, 6], does the disease start at this joint. At the time of initiation of treatment, the initial stage of rheumatoid arthritis is long over  and, according to Gschwend , distinct signs of destruction can be observed in 70% of the patients. 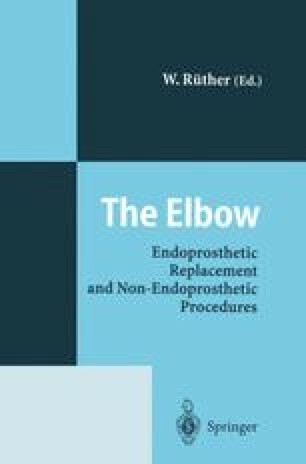 As the elbow is located in the middle of a series of joints, it is of considerable importance. Therefore, many procedures have been developed for its surgical treatment.